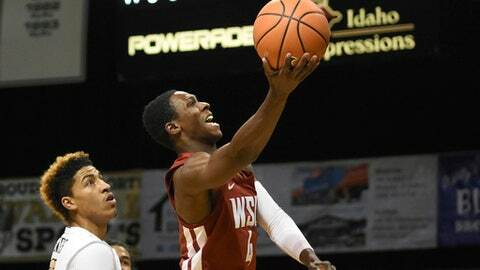 MOSCOW, Idaho (AP) Brayon Blake scored 26 points and grabbed eight rebounds, Victor Sanders added 19 points and Idaho blew out Washington State 91-64 on Wednesday night. Blake scored nine straight points, starting a 16-2 run for the Vandals (6-2) and a 22-6 lead barely five minutes into the game. They hit 4 of 5 3-pointers to that point. They ended the first half with a 13-0 run that included three treys, two by Blake, for a 49-20 lead. Blake scored 18 points in the first half on 7-of-11 shooting, including all four of his 3-pointers. The Vandals made 9 of 13 3-pointers and shot 51 percent (20 of 39) while the Cougars were at 39 percent (12 of 31), going 4 of 16 from distance. The Cougars (6-2) used a 3-pointer from Carter Skaggs and a 3-point play by Robert Franks to get it to 14 on two occasions in the first three minutes of the second half but Sanders had a 3 and five points in a 7-0 run to push the lead to 21 with 15 minutes left and Washington State never challenged. ”It’s a long season, you don’t get too up when you are 6-0, you don’t get too down, you just get ready for the next one,” said WSU Coach Ernie Kent. Perrion Callandret added 16 points with five rebounds and five assists for the Vandals. Franks led the Cougars with 16 points. Washington State: The Cougars put themselves in holes early the last two games trailing by 17 points to UC Davis and 19 points to Idaho at the half, losing two straight after winning their first six, including the Wooden Legacy Tournament Championship. Idaho: The Vandals had a 43-31 rebounding advantage and had 20 assists with just nine turnovers. … Trevon Allen had a huge block that ignited the crowd, followed by a fast break layup from Sanders on the other end to give Idaho a 22-point lead. Idaho and Washington State have the oldest continuous rivalry west of the Mississippi River. The teams met for the 113th-consecutive season. The win by Idaho is the third largest in rivalry history and largest since 1963. Washington State: The Cougars will play at UTEP on Saturday. Idaho: The Vandals go on the road to face CSU Bakersfield on Saturday.